Bartley Wilson started the Cardiff City Football Club with Sophia Gardens as its home in the year 1899. Formerly known as Riverside FC, the club changed its name in 1908. In 1910 the Club was offered area for a football ground. A piece of waste and barren land between Sloper Road and the railway sidings was accepted after Cardiff Corporation agreed to assist in preparing the ground. The ground was part waste tip and lot of work was needed to level and prepare an acceptable playing area. Mounds of ash were deposited either side of the pitch to provide banking, and the whole area was enclosed by a white timber fence. The Marquis of Bute's son, Lord Ninian Crichton-Stuart, agreed to provide financial support and in gratitude for his benevolence, the new ground was called Ninian Park instead of the originally suggested Sloper Park. The 1920s was the golden period for the 'BlueBirds' as the Cardiff City FC was popularly known amidst fans. They won their first Football League match at Ninian Park when 23,000 fans roared their favorites to a 3-0 win over Stockport County. It was during this period that the most expensive signing in Cardiff City FC's history took place when the signature of Jimmy Gill was obtained for ?750. Gill would go on to repay that investment by appearing in 184 league matches and scoring 83 goals during his six seasons at the club. In 1927 the Cardiff City FC won the FA cup with a 1-0 victory over Arsenal. The 1990s was the lowest period for the Cardiff City FC as they were relegated to the fourth division and struggled with inconsistencies and managerial mishaps. Currently they are in the third division and under their new chairman Sam Hammam, former Wimbledon owner they look poised to regain their position. 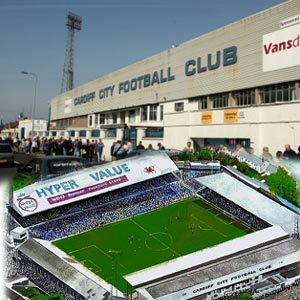 The Ninian Park, house of Cardiff City FC has a capacity of 20,000 and plans to increase it by 60,000. The ground boasts of great infrastructure and has striking floodlight pylons at each corner. It records an average attendance of over 15000 and is closely located to the Ninian Park Halt Railway Station thereby making travel plans for away visitors more convenient.